Kawaguchi Material Center/Kawaguchi Cutting Factory｜Osaka Stainless Co., Ltd.
An Abundance of Material Grades and Sizes for Immediate Delivery! At OSAKA STAINLESS, we do not source materials on receipt of your order. 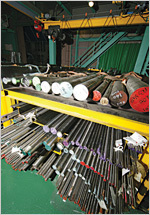 Rather, to be able to respond rapidly to your needs, we scrupulously maintain a vast stock of material grades and sizes. From a selection of over 36 different material grades and 2000 sizes, we can respond immediately, with an accurate and fast delivery from our warehouse. Amada CM400 5 units "circular saw"
Amada HFA300 4 units "band saw"
Amada CM100 1 unit "carbide"
Amada 300CNC 1unit "band saw"
Daito seiki SGA410CNC １unit "band saw"
Daito seiki GAIII330 1unit "band saw"
Tsune seiki TK5-C 3 units "carbide"
Noritake NCS-2 2 units "carbide"
For profiling, we are equipped with 20 machines, including carbide saws, circular saws and b+and saws. With a wealth of experience in cutting various material grades and forms, we can accomplish severe cutting tolerances and the prevention of diagonal cutting. We guarantee to lighten the burden of processing required after cutting.